With more turban colors than a box of crayons, Gurpreet Singh Sarin is the brightest-looking participant in ‘American Idol’ this year. He tells us about the controversy over his appearance and how he started singing in a Potbelly Sandwich Shop. Channel surfing is a little different this season. Pause long enough on Fox’s iconic show American Idol, and you might catch a glimpse of a 22-year-old with a flowing beard and brightly colored turban. Meet Gurpreet Singh Sarin, a Georgia native who, as of last Thursday, is a participant in this year’s American Idol. During the tryout stages, the judges openly discussed his gentle voice and unique look before giving him a golden ticket for Hollywood Week, and viewers around the globe took notice as well. Singh Sarin’s appearance instantly lit up Twitter as #Osama and #Turbanator began trending. Although Singh Sarin is busy in Hollywood preparing and filming for his next appearance on American Idol, he took out a few moments to give an exclusive interview to The Daily Beast. Honestly, it’s all very surreal. I still can’t believe I’m here. People are tweeting at me and saying they’re jealous, and I almost feel guilty that I’m living out my dreams right now. Has the competition been pretty much what you expected so far? Has anything caught you by surprise? I’m loving the experience, and it’s going far beyond what I’d ever imagined. My favorite aspect of it so far has been getting to interact a bit more with the singing community. It’s beautiful to meet so many people who are so passionate about singing. Even though it’s a competition, sometimes it doesn’t feel like it, because everyone has such a wonderful personality. What’s been your favorite moment so far? Was it when Nicky Minaj called you her boo-boo? That was such an incredible moment. I never imagined myself standing in front of superstars like her and getting feedback and validation from them. It’s all just so exciting to me, and I feel so blessed to be here. So many amazing singers have already been eliminated, and for me to have this opportunity is a great blessing and humbling experience. This is something I will always cherish, and I’m just trying to enjoy every moment of it. What did you like better: when you taught Ryan Seacrest your dance moves or when Keith Urban called himself Keith Turban? I loved both of them, but man, the Keith Turban comment was hilarious! I heard it was trending on Twitter soon afterwards, and some of my friends texted me some Photoshopped pictures that were circulating around where Keith was wearing a bright red turban. I loved that! Tell us more about your turban. You’ve worn a different color in every round so far, and on the show you mentioned you have about 50 different colors. What do the colors mean? There is no rule that says I have to wear a specific color or anything. I like to wear bright colors because they match well with my personality: bright, exuberant, colorful. These are the words people use to describe me, and I love wearing outfits that reflect those qualities. So far we’ve seen you wear black, lavender, baby pink, and light blue. Are you building up to anything special? In my first audition I told Nicky Minaj that I’d wear a marigold turban to match her marigold hair, so a lot of people have been asking me to bring that one out. I want to hold on to that one for a bit, though, because I have something even better in store. I recently bought some designer turbans with this amazing silver lining, and I can’t wait to wear those ones. I hope to get farther in the competition so I can keep showing America all the different styles and patterns that I have. Designer turbans? Where do you even buy those? Online. You should check it out some time. They have all sorts of interesting things on the Internet these days. Take a moment to tell us about the turban. Why do you wear one? I practice a religion called Sikhism, which is the fifth-largest religion in the world. 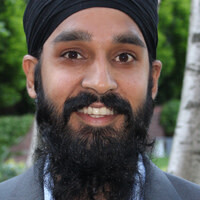 Sikhs wear turbans as a sign of commitment to their values of justice, integrity, and love. The turban is almost like a police uniform—it signifies to people that I have a certain set of principles, and that I will stand up for them. So the turban is a religious requirement? Exactly. And one thing people don’t realize is that 99 percent of people wearing turbans in America practice the same religion as me: Sikhism. This is one of the many reasons that competing on American Idol has been such an amazing experience. It provides me an opportunity to show that people who look like me are just as personable and happy as anyone else. I love your commitment to breaking stereotypes. I have to admit though that I’ve seen a lot of negative comments about you in social media. For example one of the tweets after your audition said: “Osama bin Laden cannot win AMERICAN Idol. #ThatsUnamerican.” How do you respond to comments like that? I’ve seen a lot of comments like that one, and although I was a little surprised when I first saw them, I also kind of expected something like that to come my way. I understand that some people are intolerant, but I don’t let the get to me. I just have to keep speaking the universal language of music. I’m being judged for my voice and talent and passion, not for my appearance. For me, it doesn’t matter where you’re from or what you look like or what language you speak. That’s the beauty of music. It overcomes stereotypes and negativity, and it helps bring people together. I love that. So tell us a little bit about your background. How did you originally get into music? I originally grew up in Atlanta, Georgia, and lived there with my parents and two siblings for 16 years. Music was part of our daily lives since our childhood. We were raised performing shabad kirtan (traditional Sikh music), and my grandmother’s side actually introduced us to Indian classical music when we were still pretty young. We were trained in different South Asian instruments, and then about two years ago, I started getting into modern Western music. Wait. So you only really started playing guitar and singing Western music two years ago? Yeah, exactly. I noticed that there weren’t many people who looked like me in the field, and I figured it was worth a shot. I decided to cover some tracks and post them to my own YouTube channel. After building some followers, I started performing at the Potbelly Sandwich Shop by my house in Maryland. I guess you could call that my first big breakthrough. From Potbelly to American Idol. I’d call that a step up. And all that in only two years. Since you’re competing to be our next American Idol, tell us who your musical idols were growing up. I’m from Georgia, so one of my musical inspirations is Ray Charles. One of the things I love about him is that even though other people thought of him as handicapped, he never allowed himself to be limited. He never considered his blindness to be an obstacle. Ray was able to turn a challenge into an advantage, and because of that, he was able to do some beautiful things. I love that, and of course I love his soulful music, too.